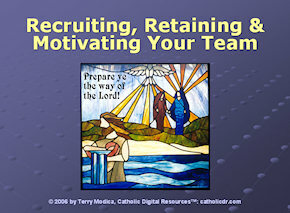 Description: This 46-slide PowerPoint Presentation covers how to recruit volunteers, how to retain them, and how to motivate them when problems arise — and how to prevent problems before they start! Learn to recognize the four basic personality types and how you can motivate all of them to work together as a highly effective team. 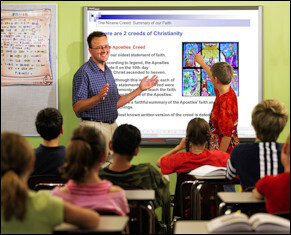 This presentation teaches the psychological techniques that successful businesses use to motivate their employees and increase productivity, morale, and job satisfaction, from the Christian perspective of parish stewardship.